Damn - what a week that was. A request that I have heard many times over in my life is "I just wish there were more hours in day", and that has never been more true than this week. It has been a particularly hectic/frantic/manic month at my day job and to be honest I could of done with extra hours in the day just to deal with that, but with the writing as well - pheww. Still, it ends on a real high - work targets achieved and new book cover - achieved! 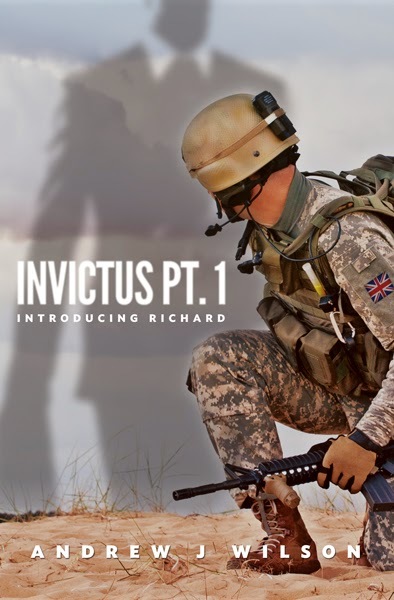 INVICTUS Part 1: Introducing Richard is alive! It currently sits with Judi, my trusted editor, who, I have to be honest, has expressed a modicum of delight at the apparent progress of my writing, and of course the cover. Now I just have to assemble the funds to allow the story to reach the publication stage: such is the life of an Indie Author. There are quicker ways, much cheaper ways, but I would actively discourage any would-be Author to travel this route - if you want to be fair to your story, to your book, to yourself and to your readers you do HAVE to invest. There are ways to save money - for example I have family, friends and work colleagues that read my material as it progresses, Beta readers sort of. These have proven to be invaluable, some from a grammar & spelling perspective and some from a story line perspective, and some do both. But they ALL help me to produce the best I can, and they're FREE - except for the occasional cup of coffee or cake! Only then will it go to Judi, my editor. In amongst all of this activity I've also managed to progress the latest WiP to the point where I think it will continue on to become my next novel. Temporarily given the title of 'Elementals', this one is way off any genre I have written in before - it's a older childrens/YA adventure - and with 10,000+ words so far the first few Beta's have been given the manuscript to cast their critical eye over. Here's the thing, because everything about this writing lark is still so very new to me I use the Beta's at this stage to check that I'm on the right track. The way I see it is that normal people are the ones that will buy or not buy my books, so it makes perfect sense to me to use 'normal' people as Beta's. The fact that some of these have other skills or knowledge around spelling, grammar etc is just a bonus: real eyes from real people is my way. There are two other WiP's that I have written that will probably never see the light of day because in discussion with some of the Beta's they have voiced concerns, conceptually they're just not good enough. So now it's the weekend - a glorious cloudless blue sky heralds the start of 'Labour Weekend', a three day weekend here in New Zealand. It's time to get out into the fresh air, take the dog for a walk along the beach and generally unplug myself from the real world for a bit. But the most exciting thing? I have hours and hours of writing opportunity ahead! A busy week - definitely. A productive week - Absolutely - but I don't think I want to do too many like it.